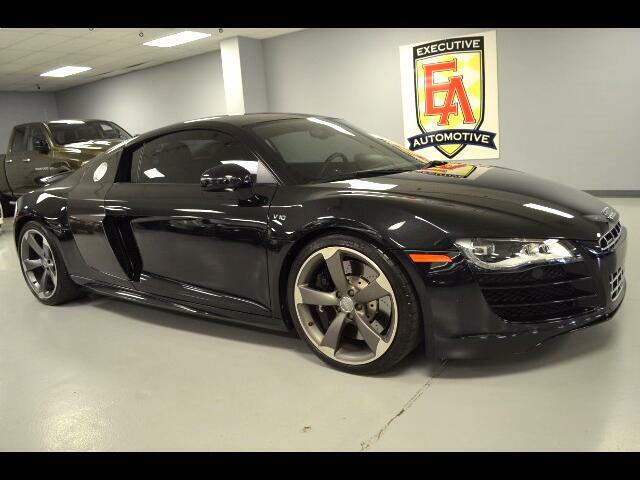 Absolutely stunning 2011 Audi R8 5.2 FSI quattro R-Tronic Coupe, Phantom black pearl with black leather, 17,115 miles. Options include: 10-WAY POWER SPORT SEATS, BANG AND OLUFSEN 12-SPEAKER, 465-WATT SOUND SYSTEM, 6-DISK CD CHANGER, AUDI NAVIGATION WITH REAL TIME TRAFFIC, BLUETOOTH HANDS-FREE PHONE INTERFACE AND AUXILIARY INPUT JACK, 19-INCH FIVE-ARM “ROTOR DESIGN” WHEELS FROM TT RS, 8-PISTON BRAKE CALIPERS AT FRONT AND 4-PISTON AT REAR, AUTOMATIC REAR SPOILER WITH MANUAL OPERATION FEATURE, AUDI MAGNETIC RIDE ADAPTIVE DAMPING SYSTEM. Contact Kyle Porter at 816-616-2500 or email: kyle@executiveautomotive.com for additional information. Thanks for your interest in our Audi!